I sat in our bed, tapping away at my phone. The night before we agreed to meet for breakfast or brunch somewhere before heading out to the Vatican, thinking it’d be easier than trying to meet up at our destination. We hadn’t, however, agreed on a place to meet and so we were shooting messages back and forth trying to figure out where to go. As it turned out our travelling companions were doing the same, yesterday’s exertion taking as much of a toll on them as it did us. We soon agreed on a place to go and a time to meet, giving us all enough time to get ready in a most leisurely fashion. Our breakfast place was a trendy little spot, hidden well away from the main thoroughfare of Rome. The breakfast was generous for the price even if the coffee was still not up to the standard that I’d expect back home. Once we were done we realized we still had a decent amount of time before we were scheduled to get into the Vatican so we started looking for other things to do to fill the time. As it turns out there’s a (relatively) small castle along the way and so we decided to walk over rather than catching a cab as we’d previously planned to. If yesterday was hot today was a dry sauna, the sun unrelenting in its quest to cook the outer layers of our skin. This was only exacerbated by the lack of any kind of breeze, even when we were close to the canal or anywhere else you’d expect at least a mild wind to take the edge off. Within eye-shot of the Vatican we quickly ducked into a small restaurant for a quick drink and to cool off, burning a few more minutes before our arrival time at the Vatican. My wife and I both got what amounted to a mint slushie that was so powerful it felt like I had just brushed my teeth for hours afterwards. We trudged over towards what I now know was Saint Peter’s Square and not the entrance to the Vatican itself. Musing over the various signs we eventually found one that pointed around the corner but were still not sure where we needed to go. This is when we made the mistake of asking one the “tour guides” to help us who then proceeded to sell us all sorts of stories about when and where we could get in. Initially he told us we couldn’t get in without a guide, then that we’d need to upgrade our tickets to get into the basilica and, once he was done trying to bamboozle us more finally settled on the low low price of €20 per person (he originally said €10) for a full tour. Of course this all turned out to be false, if you reserve tickets on the Vatican website you get everything you have to pay for and the basilica is free for all, but at least his directions to the entrance were good. The museums of the Vatican are almost incomprehensible in their scale with works in them dating back over 2000 years. The arrays of sculptures and busts to the numerous works of the painter Michelangelo that adorn numerous rooms of the Vatican are just a small fraction of what their archives contain. It’s quite overwhelming to be honest, especially when you find yourself in the middle of the Sistine Chapel, but definitely worth investing some time to go through it all and appreciate the history that is here (even if you don’t agree with the church itself, like me). After our walk through of the Vatican Museum was complete we headed out again to make our way into Saint Peter’s Basilica. Like the numerous churches we’ve visited on this trip its scale is incomprehensible at first, especially given the time at which it was built. This one however was adorned by numerous more lavish embellishments than I had seen in others, with the center altar a massive tower looming over all who came to peer at it. We saw numerous groups of nuns making the pilgramage as well as what I can assume were church groups all gathered in prayer. For me, as someone who appreciates the architecture of such places, it was still very much worth the visit although, once again, I’m sure much of the awe that others were seeing was lost on me. It was at this point that my feet decided to remind me we’d been walking for almost 6 hours straight and it was time to find a place to sit down for a spell. We found a bustling place nearby to sit down for a light “first dinner” so I could rest up before we decided on what to do next. We eventually settled on heading over to the Pantheon which, whilst a little out of the way if we were going back home, wasn’t too far away from our current position. After trying several times to get (and pay) the bill, we got on our way, my feet finally feeling normal again. The Pantheon was very similar to the one we’d visited in France although its history was vastly different. Originally a Pagan monument it was forcibly converted to Christianity some time after its initial construction. Construction which, interestingly, was done without the aid of scaffolding. This meant that the bricks were laid by skilled rock cilmbers, a dizzying prospect given just how high the roof was. After wandering semi-aimlessly for an hour or so we decided to head back to a street we’d seen filled with restaurants that looked appealing. Settling on a place that had its wood fired oven prominently displayed at the front we were soon served by an incredibly enthusiastic waiter to whom English was likely a third language. Still we managed to order and my dish, beef stewed in a sauce called barolo, reminded me of the stews my dad makes back at home. It was a fitting last meal with our friends, all of us satisfied and happy at the end of a long day. On the way home we bid our friends farewell, knowing that we’d be seeing them again back home in no short order. My wife and I took the long route home, taking in our last night in Rome and fondly remembering the events of the past couple days. It was at this point I wanted to get some little souvenirs to remember these days by, grabbing a few of the cheap plastic replicas of the monuments we had visited. Sure I could get better elsewhere, but it’s these kinds of heat of the moment things that make things like this worth more than their sticker value. Tomorrow we begin the final stage of our trip and, hopefully, the pinnacle of it: 6 nights at an all inclusive resort in Greece. This is what was missing from our last holiday some 6 years ago, a final week where our time is our own and all our wants are taken care of. It is my hope that this will give us the rest we need to come back to our normal lives rejuvenated rather than exhausted, the fresh perspective we’ve gained on this trip cemented by a week of not having to think. Indeed last night I mentioned to my wife about how I’d realized I’d forgotten the “normal” feeling that I had at the start of this trip. It’s hard to explain (although I’m sure German or some other language has a word for it) but it’s the notion of what the routine at home is meant to feel like. When we returned from the USA I had this feeling that everything had returned to was foreign, like a vague memory of a life that someone else had led. I’m getting the same feelings now, the idea of what’s normal back home feeling like another life that I led even though I’ve barely been gone a month. It was disconcerting last time however now it’s enjoyable as it means I will have a new perspective when I finally return home and, if I’m lucky, a new appreciation for all that I have. Our curtains did little to soften the morning sunlight though that barely mattered, the streets of Rome shading us from the worst of it. The early morning air was already heavy with heat, the sun’s unrelenting heat apparent the second you stepped into the light. We were up early in order to get to Pompeii at a reasonable hour, our first train set to depart not long before 9AM. It was also a pre-booked trip so missing this train would ruin any further plans we’d have for the day so our breakfast and walk to Roma Termini were brisk. However upon arrival we found our train didn’t have a gate number mere minutes before it was due to arrive. Thankfully by the time we’d tracked someone down to ask about where it might be the platform popped up and we made our way over to the carriage. We were seated and waiting but we saw no signs of our friends. Slowly the minutes ticked by, the original departure time long since passed, and still we saw no sign of them. Thankfully the train was delayed and not too long afterwards they showed up. Apparently they had boarded another train to Naples and realized their mistake not too long after but had ventured through the dining cart to grab some breakfast before taking their seats. Travelling to Pompeii was mostly uneventful save for the rather stark glance into Italy’s poorer suburbs that follow the train lines. I did not know that Italy had shanty towns, nor did I expect to see as many as I did on the train trip over. It appears that all of Italy isn’t as prosperous as its capitals, or even big city centers, would have tourists like us believe. No place is immune from poverty, of course, however the amount that I saw on our train journeys in and out of Rome is far beyond anything I’ve seen in Europe up until this point. I really must investigate as to why that is when I get the time. The most grand thing about arriving in Pompeii is not the attraction itself but the large volcano of Mount Vesuvius that looms over the surrounding region. One of our friends informed us that it is classified as the most dangerous volcano in existence, due wholly to the fact that some 3 million people lie within its potential destruction path. Right now it appears like any peaceful mountain although there are the telltale signs that it’s summit is much more than it would appear to be on first glance. Pompeii itself is an amazing snapshot of a city that thrived during the early first centuries AD. Whilst it is ruins, meaning it’s not a particularly picturesque place to visit, it is rich in history and information about the lives of the citizens who lived here thousands of years ago. Some of the larger areas, like the arena and amphitheater, are incredible examples of what the main attractions of cities would have been back in the day. It was also very interesting to see the breadth of the classes of citizens who lived there, from those just scraping to get by to the elite who had vast gardens and houses that would be large even by today’s standards. Going in the height of summer did make the trip far more exhausting than it might have been otherwise, the unrelenting heat only abating slightly in the shade and a hair more so in the breeze. Thankfully the old aqueduct systems have been re-purposed for drinking water distribution, ensuring that you will at least not die of thirst on your adventures. We all managed to get away without sunburn, although I think numerous layers of dust rather than the sun screen might’ve been responsible for that. Our trip back was a great way to wind down from the day, save for a small incident with a drunk on the regional metro (which my wife handled admirably). We had dinner at a place that came recommended to our friends by their hotel staff and I managed to convince both of them to share a glass of wine with me. I lucked out choosing a nice local Chianti that was incredibly smooth, very unlike the heavy reds we’re used to getting back at home. Tomorrow, for our last day together, we make for Vatican City. Whilst we might all miss out on the awe that the more religious among us might gain from visiting such a holy sight I know there will be more than enough for someone like me to get out of it. Should we find more time after our visit we’ll probably see what else Rome has to offer as you really can’t go far here without tripping over something historic. My only hope is that the walking is a little easier this time around as Pompeii’s long ruined streets were not easy on the feet. Day 25: When in Rome. Our friends weren’t due to arrive until later in the day so our morning was spent lazily rolling out of bed and indulging ourselves in the absolutely ridiculous breakfast buffet that the hotel provided. Over half of what was provided was deserts, ranging from icing covered croissants to cannelloni filled with coconut whilst the rest was a more traditional breakfast affair. After we’d had our fill we headed upstairs to wait around until we got the message that they’d arrived and were eager to grab an early lunch before heading out. We quickly met up at a local restaurant for some pizza and a quick catch up before we headed out to what’s arguably Rome’s biggest attractions: the Palatine, Roman Forums and the Colosseum. After elbowing our way through the crowds and various street peddlers (mostly selling frozen bottles of water and selfie sticks) we figured the lines for the Colosseum probably weren’t worth it at that point in time. Instead we got our tickets and headed over to the Palatine Hill/Roman Forum, figuring we could wander around there until the crowds died down. This area proved to be almost as popular as crowds gathered at nearly everything we walked to. It was an amazing look into a time that had it roots in prehistory and had changed so much over the course of its life. However calling the area anything more than a ruin would be generous as much of what was built was either re-purposed, pillaged or simply destroyed. That’s pretty much inevitable though given how old everything here was, predating many of the other great buildings that we’ve visited on our trip. We decided to head over to the Colosseum at 4PM in the hopes that the lines would be much more manageable. As far we could tell they were a little shorter but there was still a massive throng of people gathering at the entrance. Thankfully the wait in line wasn’t too long and we were in the Colosseum in short order. The building itself is an incredibly impressive structure, something that would’ve been awe inspiring back in its hey days. Even today it’s an impressive structure with the various catacombs exposed to show the complex labyrinth that made it such an amazing stage. It was at this time however that the flight that our friends just got off of started to catch up with them and their energy levels dropped through the floor. We ambled our way out of the Colosseum in search of dinner, settling on a place that was not too far away. Our dinner was simple but highly enjoyable, even if our friends looked like they could fall asleep at the drop of a hat. We still managed to get ourselves some gelato on the way home however and I’m hopeful that the sugar rush was enough to get them home safe. Tomorrow we’ll make for Pompeii, a trip that will likely take the whole day from us. All I’m hoping for is a train trip that’s air conditioned and a cool sea breeze as the temperature doesn’t look like it’ll go down any time soon. Not that I’m complaining mind, especially given the stories I’m hearing from back at home, but I’d prefer to come back medium-rare rather than well done. Day 24: Auf Wiedersehen Munich, Ciao Roma. I spent the night before out flight out of Munich like I always do: fretting about making sure we’ve got everything lined up so we can get there on time. Initially we were doing well: getting up early, having a brisk breakfast and getting checked out on time. All in all we left a little later than I wanted to but this was more than made up for by a cab driver who had little respect for speed limits. We arrived at the airport almost exactly 2 hours before our departure time, the amount I had been told I’d need to make it through Munich airport. But this is where the wheels started to come off. I routinely forget that the cabs here are mostly cash-only, meaning the meager amount of euros I carry around with me usually gets depleted by cab fares alone. This time was no different however the cab fair was, frankly, extortion, and the amount I had in my wallet wasn’t enough to cover it. So I darted out into the airport in search of an ATM, luckily being able to find one after 5 minutes of semi-panicked running about. However our little cash card said there wasn’t sufficient balance on it, forcing me to pull out the credit card (which will incur the dreadful day 1 interest rate slug). With the cab driver paid we lined up at the Air Berlin check-in counter which was moving painfully slow. Worried that we wouldn’t get checked in on time I got on the wifi to do a web check-in. The website then helpfully informed me that the booking, made via Air Berlin, was being serviced by their partner airline Alitalia. Since we’d been in the line for about 20 minutes at this point I got a little worried and tracked down the information desk to figure out what the go was. As it turns out had I stayed in that line I might very well of not got on the flight as we couldn’t check in at the Air Berlin desk. Even more frustrating was the fact that our booking didn’t allow web check-in for some reason, making the wait in line a rather stressful affair. Thankfully we managed to get checked in and everything was ok but it certainly wasn’t the way I was hoping to spend my morning. The flight over was your stock standard cut rate affair, although they did have a free snack service which was a nice touch. Once we landed it was a quick trip through the airport to get our bags and then out to a cab which would take us straight to the hotel. What instantly struck me about Rome was the seemingly symbiotic combination of new and old work structures. We passed by many ancient bridges, towers and various other pieces of Rome’s history that were living side by side with their modern equivalents. There are also numerous buildings that retain the old fascia of the ancient structure, only to be flagged on all sides by modern architecture built to hold it in place. It’s a fascinating contrast to many of the other historical places we’ve visited, nearly all of which preserve the entire structure in tact. I guess the population density has something to do with it, although a cursory search reveals it’s actually less dense than most of the other European capitals. We capped off the night with a nice dinner at a restaurant close by and gelato from the place next door. The next 3 days are likely to be filled with activity so we thought it best not to overdo it, turning in relatively early for the night. Tomorrow will bring with it our friends who just happened to be planning to go to Rome at the same time we were and likely a flurry of activity to follow. My wife and I both agree that travel with friends is always more fun and so we’re eagerly awaiting their arrival so the group shenanigans can begin. Finally, Confirmation of How the Sun Works. The sun is an amazing celestial object. Even though it looks about the same size as our moon when viewed from Earth’s surface it’s almost 400 times further away which should give you an idea of just how unfathomably large the sun is. It also heavily influences nearly every aspect of our Earth, providing nearly all of the energy that we, and all other lifeforms on this planet, consume on a daily basis. You’d be forgiven for thinking that we understood it completely however as whilst nearly anyone would be able to tell you that the sun is powered by fusion we, funnily enough, didn’t actually have proof of this. It sounds silly right? The theory of the sun being a giant ball of fusion has been around for 75 years and is pretty much established as a scientific fact. Indeed many of the observations that we’ve made of the sun support that theory and the small scale replicas we’ve made also seem to exhibit similar properties. 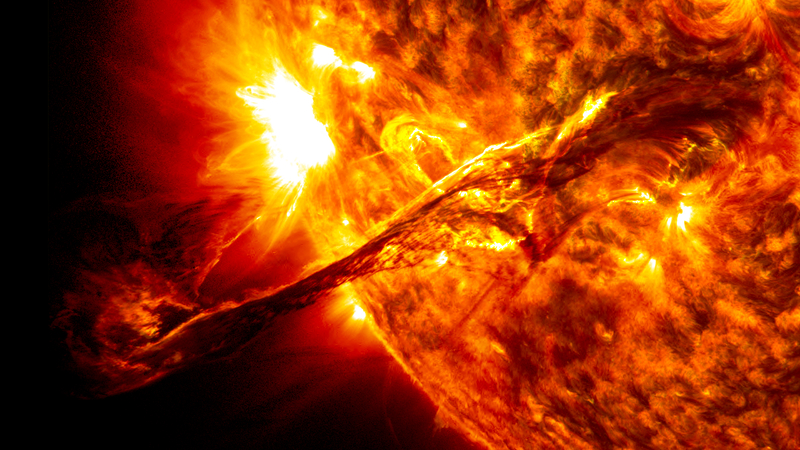 However the surface of the sun, as we see it, doesn’t really tell us the whole story. Indeed the light emitted from the surface of the sun is hundreds of thousands of years old, spending most of its life worming its way out of the deeper layers of the sun. Should we want to verify that for sure we need to observe the products of fusion reactions happening now and, bar venturing into the sun itself, there’s only one way to do that: by observing one of our universe;’s most elusive particles, the neutrinos. Specifically the neutrinos are called PP neutrinos, those which arise from the fusion of two protons to form helium. A fusion reactor on the scale of the sun generates countless numbers of these particles every second and, thanks to their near massless nature, they rush out unimpeded directly from the sun’s core. However the same properties which allow them to move at such great velocity away from the sun also prevents them being easily detected. Combine this with the fact that PP neutrinos carry less energy than regular neutrinos do you can see why definitive proof of fusion happening within the sun as eluded us for so long. Researchers in Italy though crafted an experiment to capture these ever elusive particles and their research has finally bore fruit. The Borexino experiment uses a large device called a scintillator, essentially a large array of light detecting devices immersed in ultrapure water. It’s then buried deep underground (about 1.4KM) in order to shield it from cosmic rays and other stray radiation. This experiment was specifically designed to verify the solar output of neutrinos against the standard solar model in order to verify that fusion was indeed occurring within our sun. It began collecting data about 7 years ago and at the beginning of this year they had enough data to submit their final report. The results line up perfectly with what the standard solar model predicts which, for the first time, verifies that fusion is indeed occurring within our sun and has been for a very long time. It may seem like a silly thing to do but verifying things like this is the key to ensuring that our understanding of the universe is in line with reality. We might have known that fusion was going on the sun for decades but without definitive proof we just had a good model that matched some of the observed behaviours. Now we know for sure and that means that our standard solar model is far more robust than it was previously. Thus, with this new information at hand, we can dive even deeper into the model, probing the various curiosities and figuring out just what makes our sun tick. We might not ever know everything about it but part of the fun of science is finding out what you don’t know and then trying to figure it out.